Adenosine Deaminase (ADA) (E.C. 3.5.4.4.) is an enzyme that catalyzes the conversion of adenosine and 2'-deoxyadenosine to inosine and 2'-deoxyinosine. Adenosine Deaminase is widely distributed in various tissues and cells. There are two isoforms, ADA1 and ADA2. ADA1 is widely expressed in most cells in the body, particularly in lymphocytes and macrophages. It is present in the cytosol, nucleus and found associated with dipeptidyl peptidase-4 on the cell membrane. ADA2 was first found in the spleen but is predominantly found in the plasma and serum. Increased serum ADA levels are found in certain infectious diseases such as tuberculosis and various liver diseases such as acute hepatitis, alcoholic hepatic fibrosis, chronic active hepatitis to name a few. Adenosine Deaminase is also a marker for T-lymphocyte proliferation. In LSBio's ADA Activity Assay, inosine formed from the breakdown of adenosine is converted to uric acid with ADA Convertor and ADA Developer. The uric acid is measured at OD 293 nm. The kit measures total Activity of Adenosine Deaminase with limit of quantification of 1 mU recombinant Adenosine Deaminase. 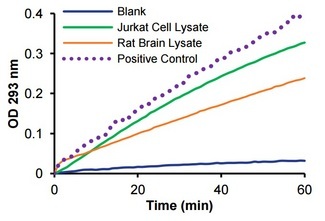 This assay measures total Activity of Adenosine Deaminase. 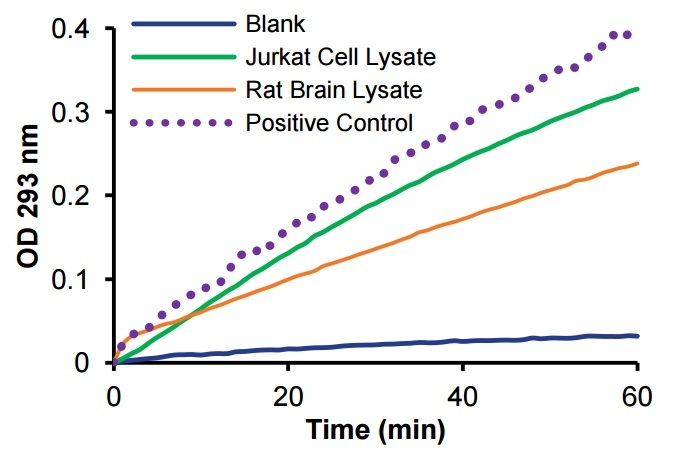 ADA specific activity in rat brain lysate and Jurkat cell lysate.